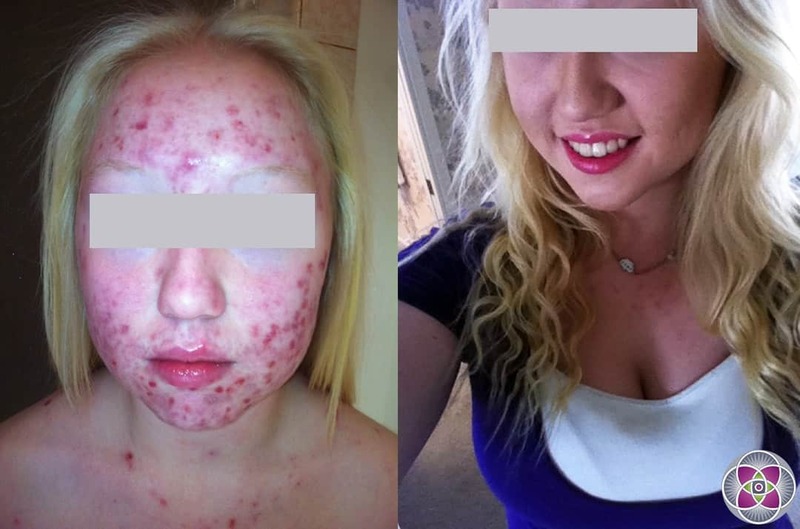 Eliminate acne and cystic acne without antibiotics or Accutane. We know what a huge difference being proud of your appearance can make. Let us help you achieve the glowing, confidence-building complexion you deserve by eliminating acne with our laser treatments. Watch the video : What is laser treatment for cystic acne? Get ready to love looking in the mirror again! 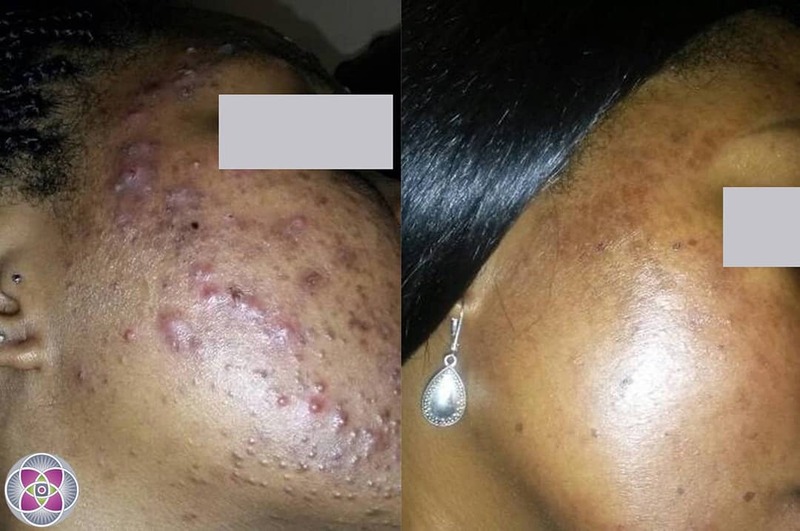 Our more natural approach to cystic acne treatment will return your skin to vibrant health and beauty without dangerous drugs by precisely targeting the cause of the acne. 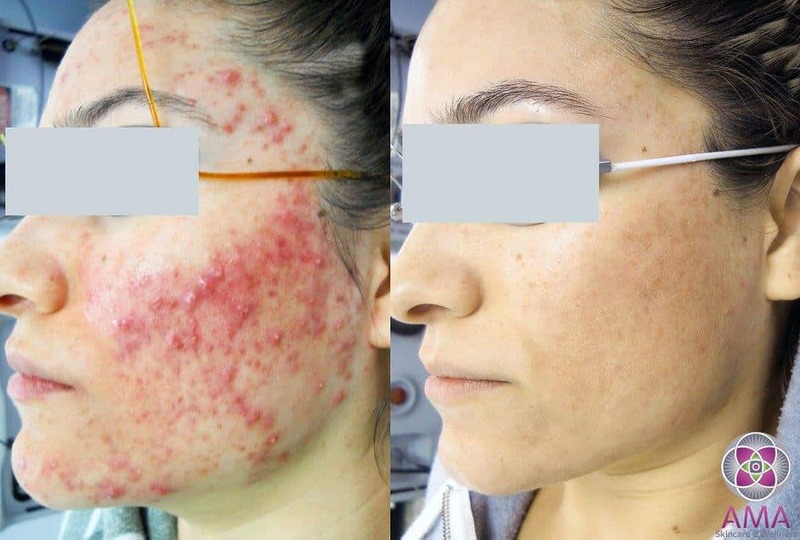 A comprehensive laser treatment package includes acne-specific lasers for inflammation, swelling, redness and pigmentation, and can incorporate BlueLight, or “photodynamic” treatments. Silk peels (dermal infusions) are often recommended, which deeply infuse and nourish the skin with specialized formulations such as salicylic acid to further remove acne and breakouts. 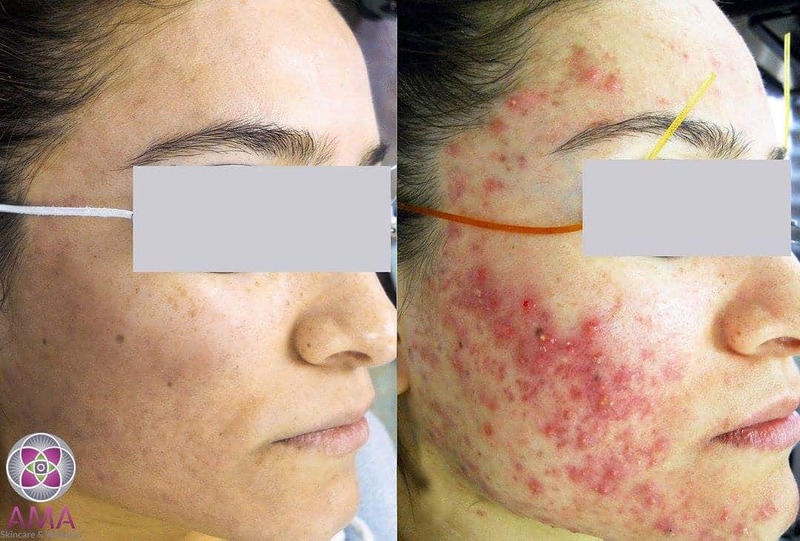 Cystic acne treatments require specific lasers, which target the bacteria that infects follicles, eliminating the infection without antibiotics or medications like Accutane. A specialized BlueLight can also be used for this purpose. 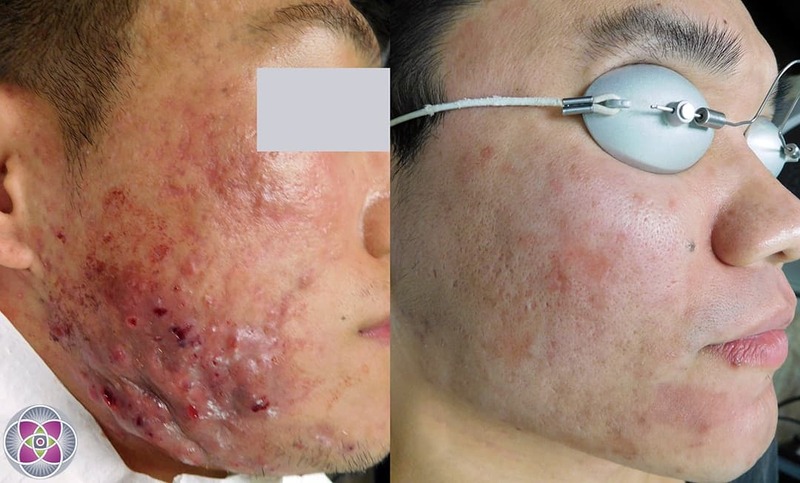 With the infection now in retreat, we use 2 or 3 additional lasers to shut down hyperactive sebaceous glands and reduce the inflammation that often accompanies acne and cystic acne. This reduces swelling, and removes redness and hyper-pigmentation. The final step utilizes specialized lasers that precisely vaporize the outer-most dead layer of skin (epithelial peel) and also induce a complete regeneration of a brand new epithelium that looks absolutely radiant. In many cases, cystic acne treatments are integrated with a package of silk peels (dermal infusion facials) administered by one of our nurses. The dermal infusion procedure infuses your dermis with a variety of natural substances, including salicylic acid, which is clinically proven to further reduce acne and cystic acne breakouts. In this procedure, a precise amount of the dead layer of your skin (stratum corneum) is also removed, which promotes further healing and rejuvenation of your skin to its silky-smooth, radiant state. In addition, the nurse will customize a daily anti-acne home regimen. 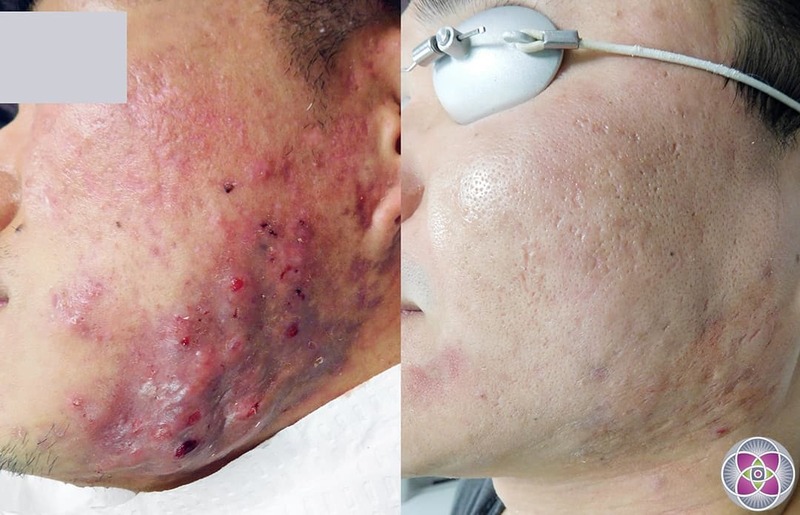 In the most severe cases of cystic acne with active lesions, our laser protocols might not be of sufficient strength to achieve the ideal result, so we customize a treatment that combines lasers with photodynamic therapy with ALA.
First, Levulan is applied to your skin and left on for a 30-35 minute incubation period. This clear solution is 20% Aminolevulinic Acid (ALA is a natural substance found throughout your body). Once absorbed into your skin, the ALA is activated with a specific wavelength of light in the blue spectrum, taking about 10-15 minutes. Active cells such as sebaceous glands absorb ALA, and when the ALA is activated by the blue light, a patient’s overactive sebaceous glands are dramatically impacted and shut down – hence the term “photodynamic” acne treatment. The ALA will also target sebaceous hyperplasia (small 1-3 mm bumps on the skin) and the papules of acne rosacea. Skin oiliness is decreased and the appearance of pores minimized. The entire skin texture improves following a photodynamic acne treatment. 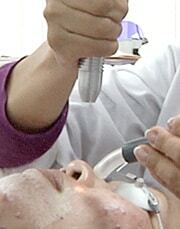 After BlueLight treatment, the typical patient will experience redness, peeling and crusting for several days. Usually the first 2-3 days are the most intense. Complete resolution typically requires 2-3 weeks. Pressed mineral base foundation will hide most of the redness. Remaining indoors is advised for 2 days following your treatment to avoid sun exposure, as there is photosensitivity for up to 48 hours. 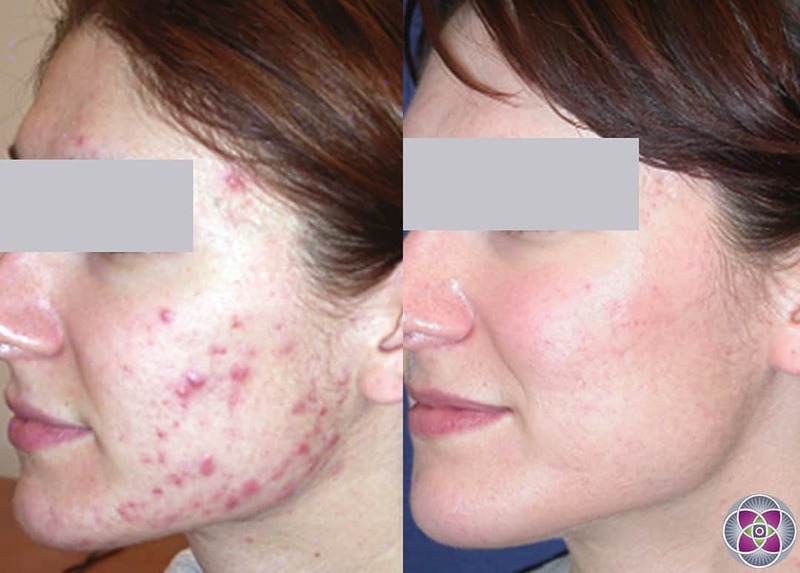 The advantage of this treatment is the rapid reduction in cystic acne lesions without scarring or surgical excision. Your skin appears refreshed and younger following each treatment. 2-5 treatments are advised, with 3-4 week intervals in between to obtain optimal results. There are no known systemic side effects to BlueLight. In order to enhance ALA absorption into the skin, we recommend that a portion of the outermost dead layer of skin be removed (stratum corneum) before application. 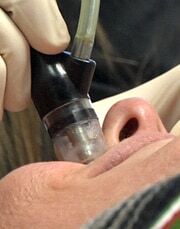 Typical methods include various skincare scrubs, dermabrasion or laser epithelial peeling techniques. Q. Does it work on acne on the back and shoulders? A. Yes it does. It works any where on the body to remove acne. Q. Does this laser treatment work on people with dark skin? A. Yes it does. We customize the protocol for different types of skin, and different colors of skin. That is why we have so many lasers. When evaluating color of skin, there are 6 different skin types… the protocols may differ for each of these. When is comes to oil content, there are also different skin types for which the cystic acne treatment protocols are customized. Ethnic and racial heritage also factors in. Bottom line, whatever skin type you have, the treatments will work to get rid of your acne. Q. I have red marks on my face from acne. Will this treatment get rid of the red marks? A. Yes it will. Some acne results in brown spots, some in red spots. What ever kind of spot you have, it is a consequence of the inflammation that occurred due to the acne. The protocol will be customized to deal with which ever you have! Q. Is this cystic acne treatment painful? A. No. The treatments are entirely comfortable. We use two layers of topical anesthetic on your skin for an hour before the treatments. Q. How long before the acne goes away? A. Depends on the kind of acne and the severity of your condition. Generally, successful outcomes require 3-5 treatments. Some cases of very severe cystic acne may require more. Once the cystic acne has subsided, we often give our patients 4 monthly laser treatments at no charge, just to be sure the acne does not return. Bottom line, the longer your skin stays clear of the acne cysts, the smaller the chance the cysts will return. Q. How much does this cystic acne treatment cost? A. Typically, the cost per treatment is $500 to $750 per laser. Once we have evaluated your skin in-person, we will be able to determine how many treatments you will need. Q. I have folliculitis. Will this treatment help me? A. Yes. 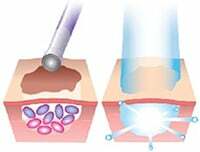 Laser treatments can be extremely helpful in healing folliculitis. Antibiotics may also be needed in some cases of folliculitis. Alternatively, the use of ozonated olive oil has proven very effective as a home remedy for reducing folliculitis. Q. 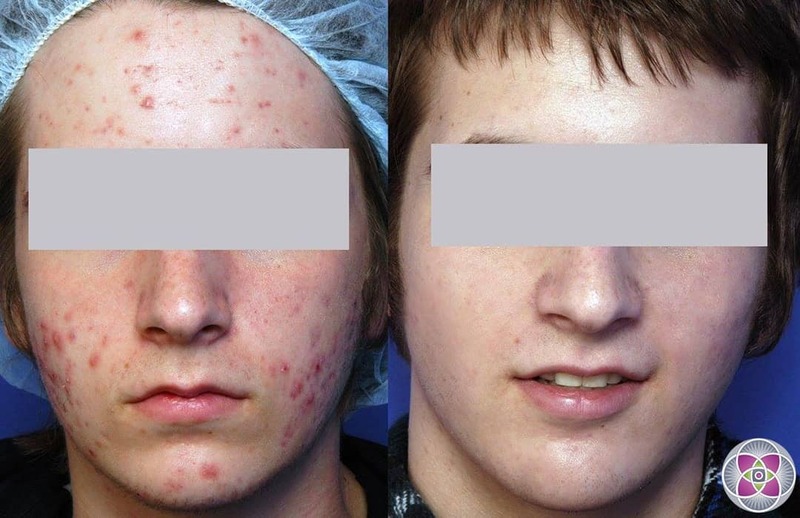 How long have you been performing these type of laser treatments for acne? A. 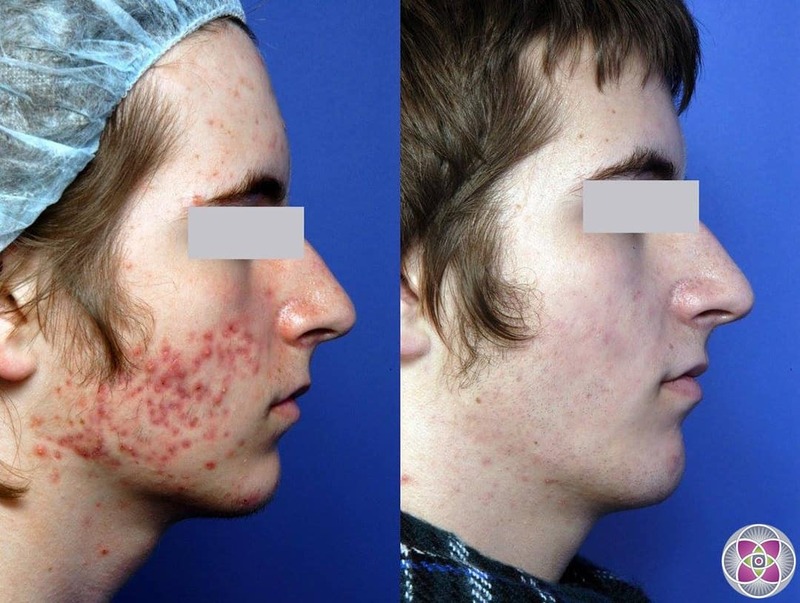 For 20 years now we have been developing and performing proprietary treatment protocols for acne and acne scars. Our cystic acne treatments have been proven so effective that many of our patients fly in from all over the world. New patients often hear about us from their friends who suffered from the same condition and had dramatic results.